When I heard that Anchorage, a new ‘East Coast’ restaurant, had opened in West One Plaza, I was looking forward to trying somewhere new – and that’s before I even realised this venue is part of the Harley and Wick at Both Ends family. 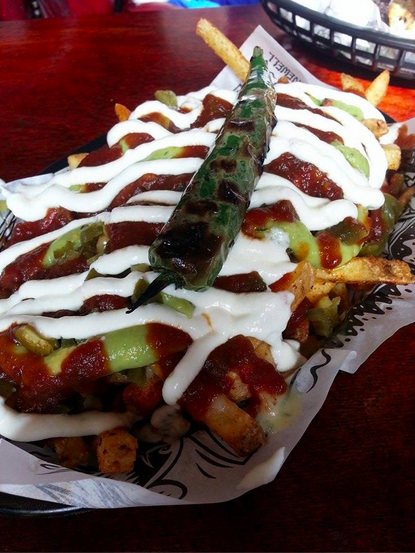 The Harley and the Wick are two of my favourite places to eat in Sheffield, so when I realised Anchorage was related to these two, I couldn’t wait to give it a go! First impressions of Anchorage Bar were positive. It’s a bright and airy venue, with the same quirky touches and indie charm I love so much about the Wick at Both Ends. If you’re a fan of the Wick, like I am, the cocktail menu will feel instantly familiar, as a couple of Wick cocktails have made the transition to Anchorage Bar. This doesn’t mean the drinks menu is a carbon copy, as Anchorage also offers a large and unique selection of imported beers, plus a very special prosecco sharer that’s actually served in a lobster cage! This ‘Mo Money Mo Problems’ is described as “the ultimate sharer” and, since it apparently consists of a whole bottle of prosecco, 6 shots, plus the aforementioned lobster cage, it sounds like it lives up to that description! I was dying to see what this beast actually looks like but sadly, at £40 it’s not exactly the sort of thing you order on a whim! Despite this being my very first visit to a brand-new venue, I have to admit I ended up ordering a cocktail I’ve already had many times at the Wick at Both Ends – a Corpse Reviver (£7). This deceptively-dainty looking drink is a potent blend of Buffalo Trace, Cointreau, Lillet Blanc and Absinthe. Sadly, my Corpse Reviver was nothing like the “guaranteed to raise the dead” cocktail I remembered from the Wick. It tasted overpoweringly of lemon, and didn’t pack half the punch I’d been expecting. I haven’t ordered a Corpse Reviver in a while, so it’s possible the Wick have changed their recipe, or maybe Anchorage’s barman was simply having a bad day. Either way, I switched to wine for the rest of the evening rather than risk ordering another cocktail. 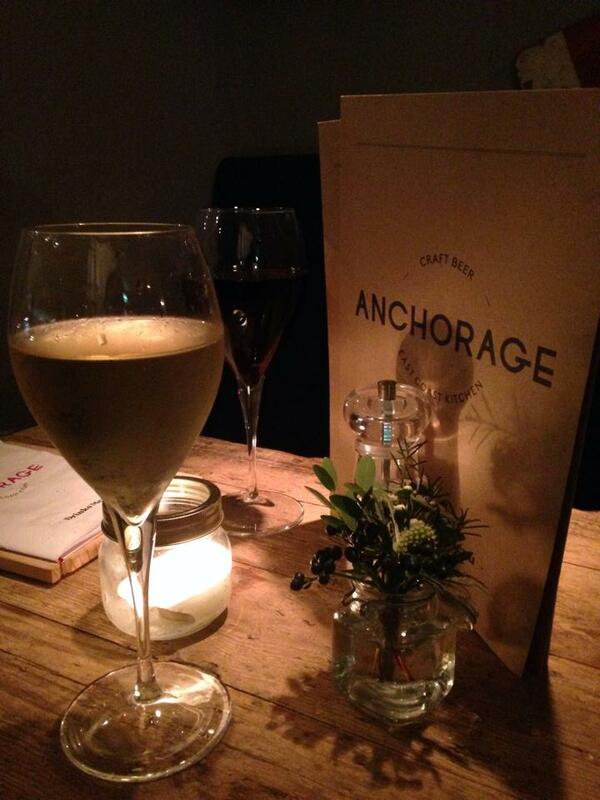 Since this was my first visit to Anchorage, I took my time scrutinising the food menu. In addition to the usual Starters, Mains, and Desserts sections, the menu also includes an enormous deli section made up of 6 inch subs, deli sandwiches, and a “build your own” board of cheeses and meats. For me, the meat and cheese board is the most exciting thing on the deli menu, as it comes with pickles, focaccia and squid ink bread. When summer rolls around, I can’t think of anything better than sharing a board of cheese and squid ink bread, with a cheeky bottle of wine on the side. Sadly, summer isn’t about to roll around anytime soon – in fact, by the time I’d read through the deli menu and polished off my sour Corpse Reviver, it had already grown dark outside. It was high time we got serious and actually ordered some food! 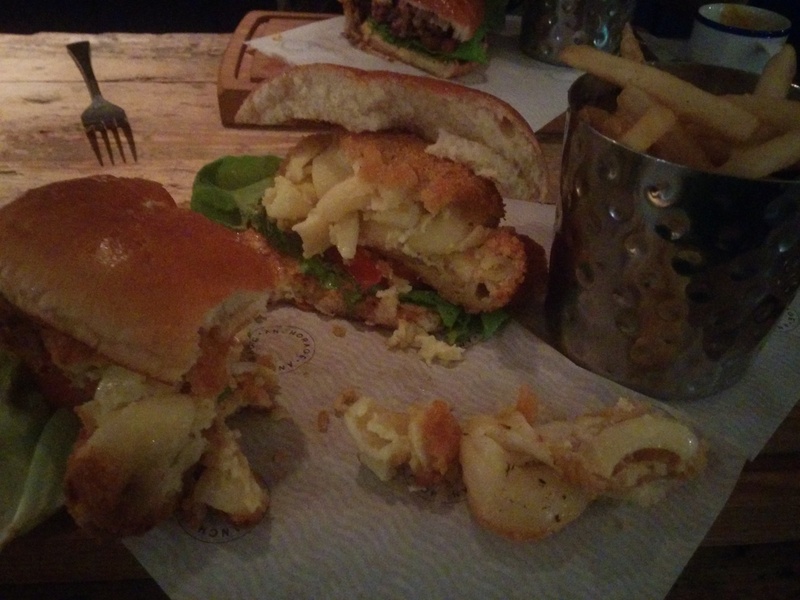 I opted for some comfort food, in the form of a Mac and Cheese burger (£8). I’ll admit the first time I saw a Mac and Cheese burger on a menu, I thought it sounded hideous. But then curiosity got the better of me and I ordered my first ever mac and cheese burger. I loved it, and have been ordering them ever since. Anchorage’s version of a mac and cheese burger is incredibly strong. Whatever cheese they use in these burgers, it’s strong and salty, and has a tanginess that reminded me of blue cheese. 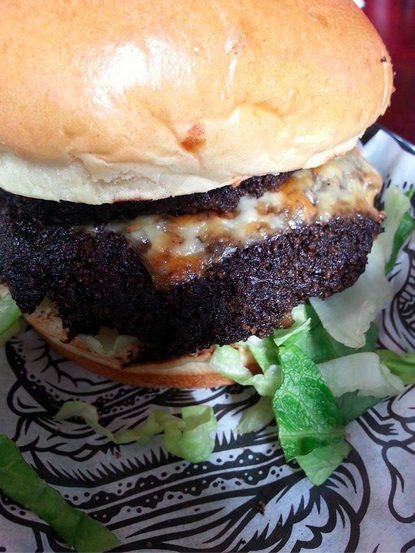 If you like your cheese mild, then you should avoid this burger! 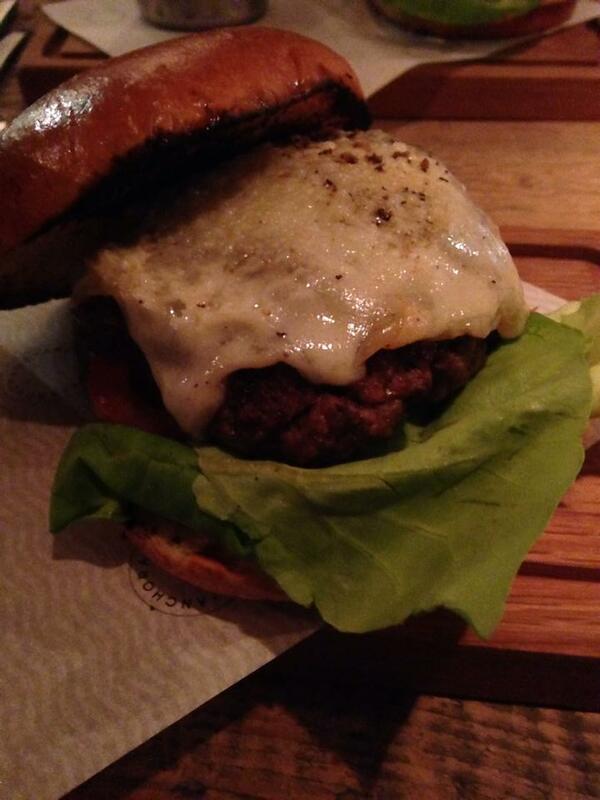 For me, when it comes to cheese it’s a case of the stronger the better, so I loved the taste of this burger. The patty had been cooked just right too, which was a relief – no one wants soggy pasta or overcooked, rubbery cheese in their burger. Anchorage’s mac and cheese burger is a filling and stodgy carb-fest. Just a few bites in, I knew there was no way I’d be able to eat it all. 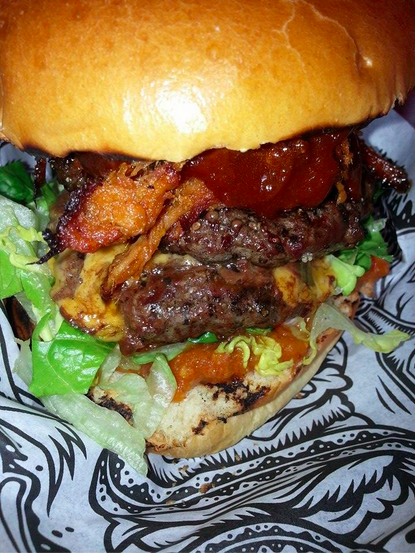 This is comfort food at its best, but I’d only order this again if I was seriously hungry, because this is one heavy burger! My dining companion had also ordered a burger, but instead of pasta and cheese, their burger patty was made from 35 day, dry-aged beef, topped with a wedge of melted cheese (£8.50). Clearly, the Anchorage chefs aren’t worried about your waistline! This burger got a big thumbs up for the generous helping of cheese, and the thickly-glazed brioche bun. We left Anchorage absolutely stuffed and, apart from that dodgy Corpse Reviver, feeling like we’d got good value for money. I’m already planning a second visit so I can sample that delicious-sounding deli menu! 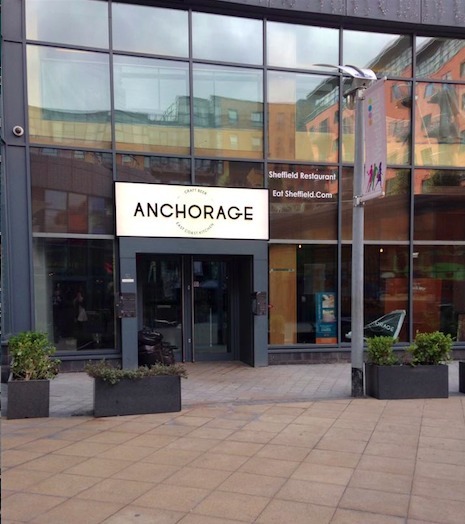 Suffice to say, Anchorage is already well on its way to joining the Wick and the Harley as one of my favourite places to dine and drink in Sheffield.